Flight to Faro in Portugal and transfer to your hotel on Isla Canela in Spain for seven nights half board accommodation. The transfer takes around an hour, but you have to put your watches on an hour when you cross the Guadiana which is the border. In resort with three included excursions. There is plenty to do in your free time. The front of the hotel looks across to the thriving fishing village and marina of Punta del Moral. You can have a pleasant stroll around the harbour or take a little ferry ride across to Isla Cristina. The rear of the hotel backs on to the promenade from where there are wooden boardwalks across the dunes to the beach and the sea. Walking past the inviting chiringuito (beach bar) might be difficult! There is a frequent bus service which makes the 5 mile journey to Ayamonte on the Guadiana river. Ayamonte is a bustling ‘frontier’ town with a compact old centre, marina and port. The ‘frontier’ is the river and for under 3 euros you can get a return ferry across to the pretty town of Vila Real de San Antonio in Portugal. If you can find the time, a complimentary 1 ½ hour circuit of the hotel’s extensive spa facilities is included for you! The first included excursion is to La Rabida Monastery, Caravelle Wharf and El Rocio. Just over an hour to the east of your hotel lies the monastery of La Rabida, where Columbus stayed with the monks before his voyage to the New World in 1492. The King and Queen of Spain had rejected his request for funding to seek a westward route to China, but with the intercession of the monks (who were to get a percentage! ), funding was granted…and the rest, as they say, is history. Nearby lies Caravelle Wharf, with full size replicas of Columbus’ three ships – the Pinto, the Nina, and the Santa Maria (entrance fee included). All are much smaller than you might expect – but they actually travelled across the Atlantic in 1992, for the 500th anniversary. You then travel to the strange town of El Rocio, which seems like something out of the Tex-Mex West, with clapboard houses, sand covered squares and avenues and rails to tie your horse to! But this is no tourist movie set in fact it is a major pilgrimage site, and lies at the edge of the Donana Natural Park. There is free time for a late lunch here before returning to your hotel. Another included excursion takes you to the unique landscape and ecosystem that are the Rio Tinto mines. There has been mining in the hills 80 miles northeast of Isla Canela for over 5000 years. In the museum in the town of Rio Tinto there is an excellent re-creation of the Roman mine. There is British influence in many parts of Spain but nowhere as pronounced than in this remote corner of Andalucia. The pinnacle of mining in the area began in 1873 with the arrival of the British Rio Tinto Mining Company Ltd who paid £3.68 million for the rights to exploit the disused copper mines. The company employed up to 20,000 men, laid 300km of rail track, built houses for employees and management, a protestant church and a Social Club which had a cricket team and introduced football to Spain. The museum is housed in the company’s hospital and its offices are now the town hall. Highlight of the tour is the rail journey through the open cast mines where you’ll see an amazing ‘Martian’ landscape with the red (bright red!) Rio Tinto river running through it. (NB the train is accessed down a long flight of steps – no ramp). You really chill out and relax on your third excursion – a boat ride up the Guadiana river. 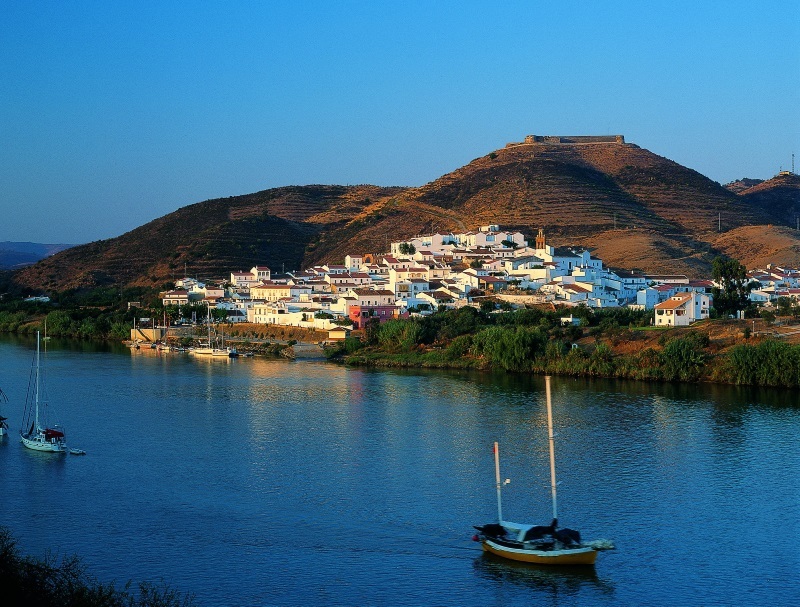 The boat leaves from Ayamonte and poodles upstream through the soporific scenery of the gentle hills of the Guadiana valley. The captain might stop in Portugal on the left – then again, it might be Spain on the right – either way, you’ll have the chance to enjoy the hospitality of one of the riparian communities. The return to your hotel will be by coach. Transfer back to Faro Airport for your flight home. You can put your watch back an hour after crossing the river.